The boat Giacomo uses for this journey, as well as for Un Altro Po, was constructed by his friend, master boatbuilder Roland Poltock. Designed by Scottish designer Iain Oughtred, the boat is a 19’ (5.6m) Ness Yawl, similar to those the Vikings once sailed and the kind fisherman from the Shetland Islands still use. 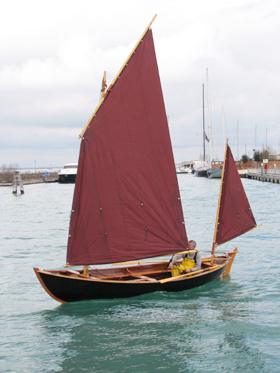 Clinker- planked with mahogany plywood, she’s light but very seaworthy, good for both rowing and sailing. Beautiful boat, and fantastic website. I am enjoying following along on your trip. Dreaming/Planning my own. Could you please explain to me the purpose of the mizzen mast on your boat? I’ve noticed you often have it up even when the main is down. Is the Ness Yawl capable of sailing close hauled? Does the mizzen help with this? magical boat indeed! ….whats her name by the way? she has a retractable sword if i am guessing correctly !?!? @david: from my expirience the mizzen helps alot with stability…reaching (can almost steer), and especially heaving to with it is a dream! My Dear friends I apologise for my delay. I didn’t read this page before today. Thank you for your comments and wishes. The boat is 5.60 by 1.52 by 12 by 90. 9mm maya 9 layers plywood by Bellotti Italy. Oak by Italy. The Neas Yawl, named Clodia can close up to 55 degrees. Less on flat water. Is not a great tacker but can give you some nice emotions. Very stable and dry boat. Fast. Top speed was 9 knots on a gust with three reefs. After Novi Sad. Speed over water. SOG was 12 knots. Current. Downwind is very safe and seaworthy. Balanced lug is very effective and easy rig. The mizzen is essential. When the wind is exceeding 25 knots I take off the main mast and sail with only the mizzen. She can give me downwind and reaching (centerboard down) speed in excess of 4 knots. Then two masts very good for fixing the tent, drying clothes etc. Any more info on Classic marine or Jordan Boats.